Mombasa rests on the exotic shores of the Indian Ocean and serves as a globally popular vacation destination thanks to its classy hotels and friendly and relaxed atmosphere. On the 19th (Sat), identify plant and animal life at Wildlife Areas. To find reviews, where to stay, other places to visit, and other tourist information, go to the Mombasa trip itinerary planner . Amsterdam, The Netherlands to Mombasa is an approximately 14.5-hour flight. The time zone difference moving from Central European Time (CET) to Eastern African Time (EAT) is 2 hours. Plan for warmer temperatures traveling from Amsterdam in October, with highs in Mombasa at 35°C and lows at 25°C. Wrap up your sightseeing on the 19th (Sat) to allow time to travel to Watamu. Hailed for its picturesque scenery and pristine beaches, the village of Watamu on Kenya's Indian Ocean coastline attracts both adventure seekers and those looking for a relaxing seaside holiday. On the 20th (Sun), get engrossed in the history at Gede Ruins and then take an exotic tour of a safari tour. Inspirock's itinerary builder makes planning a Watamu trip simple and quick. Getting from Mombasa to Watamu by combination of flight and taxi takes about an hour. Other options: drive; or take a bus. In October, plan for daily highs up to 34°C, and evening lows to 28°C. 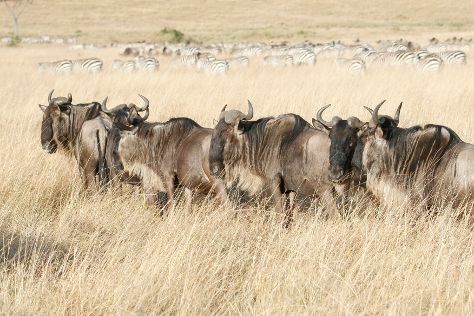 Wrap up your sightseeing on the 20th (Sun) to allow time to travel to Maasai Mara National Reserve. Home to the Great Migration and Africa's exceptional wildlife, Maasai Mara is a must on a Kenya itinerary. Start off your visit on the 21st (Mon): look for all kinds of wild species at Olare Orok Conservancy. Here are some ideas for day two: explore the striking landscape of Mara Triangle. To find other places to visit, photos, maps, and other tourist information, read our Maasai Mara National Reserve online day trip planner . Traveling by flight from Watamu to Maasai Mara National Reserve takes 4.5 hours. Alternatively, you can do a combination of car and flight; or drive. Expect much colder temperatures when traveling from Watamu in October; daily highs in Maasai Mara National Reserve reach 20°C and lows reach 10°C. Wrap up your sightseeing on the 22nd (Tue) early enough to travel to Nairobi. Start off your visit on the 23rd (Wed): take an exotic tour of a safari tour. Keep things going the next day: stroll through Giraffe Centre, see the interesting displays at Karen Blixen Museum, then tour the pleasant surroundings at David Sheldrick Wildlife Trust, and finally admire all the interesting features of Mugie Ranch. For maps, ratings, and more tourist information, go to the Nairobi trip itinerary builder website . Traveling by flight from Maasai Mara National Reserve to Nairobi takes 2.5 hours. Alternatively, you can do a combination of taxi and flight; or drive. Plan for somewhat warmer temperatures traveling from Maasai Mara National Reserve in October, with highs in Nairobi at 30°C and lows at 19°C. Wrap up your sightseeing by early afternoon on the 25th (Fri) to allow enough time to travel back home.